We start in Chamonix, France – alpine mountaineering and skiing world capital. The first days are spent doing practice climbs on both rock and snow, aimed at helping you in any area you may need to perfect technique. 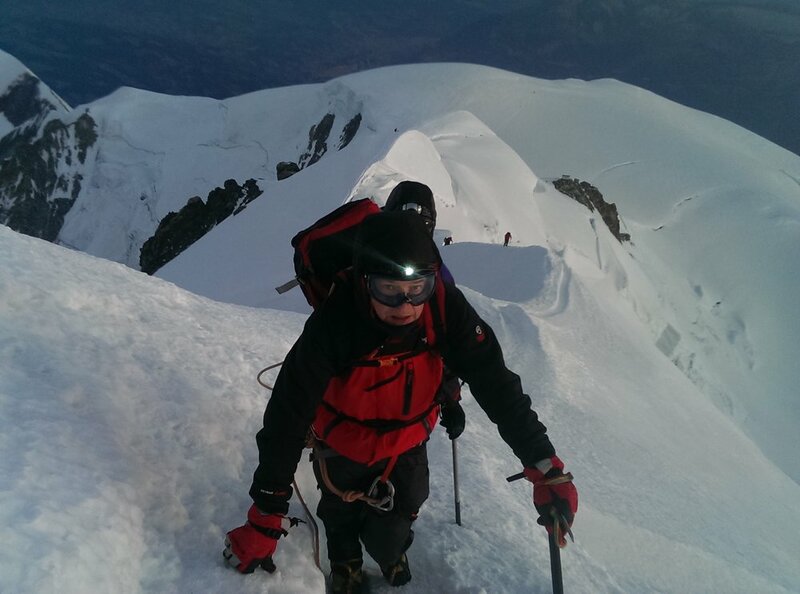 This is followed by the ascent of Mont Blanc, highest summit of the Alps. Next we are off to Zermatt, Switzerland to take on the Matterhorn. Our final destination is Grindelwald, home of the infamous Eiger and the final summit of this alpine trifecta. Memories of a lifetime, never to be forgotten. My Trilogy program combines just the right amount of physical and physiological preparation needed to tackle all 3 giants of the Alps. It is by far my most prestigious program offering of the summer season and certain to provide any mountaineer with a lifetime of memories and unforgettable moments in the high mountains. This is a fine introductory rock climb located in the Aiguilles Rouges (Red Spires) mountains, just opposite the Mont Blanc range. 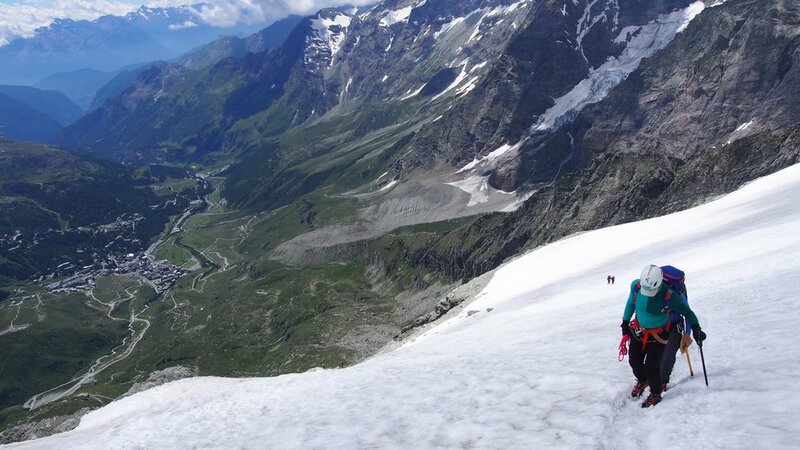 This climb offers exceptional views of Mont Blanc and it’s surrounding summits and also gives some fine climbing and a taste of what to expect in the days that lie ahead. The route is entirely on rock along a sharp edged ridge to the summit of the Aiguille Crochues 2840m. Today we will work on spending time at altitude to better acclimate. From the summit of the Aiguille du Midi cable car, we follow the thin snow covered ridge towards the Aiguille du Plan 3673m. The climbing involves many stretches of snow, rock and mixed ground – the perfect opportunity on which to test your skills. After the climb, we traverse back along the same ridge and start our traverse towards the Italian border to spend the evening at the Torino hut to help acclimate for the remainder of the week. Night at the Torino Hut. The traverse of the Aiguille d’Entreves is one of the finest ridge traverses for it’s grade in the Alps. Stunning scenery and splendid climbing are both present on this outing. 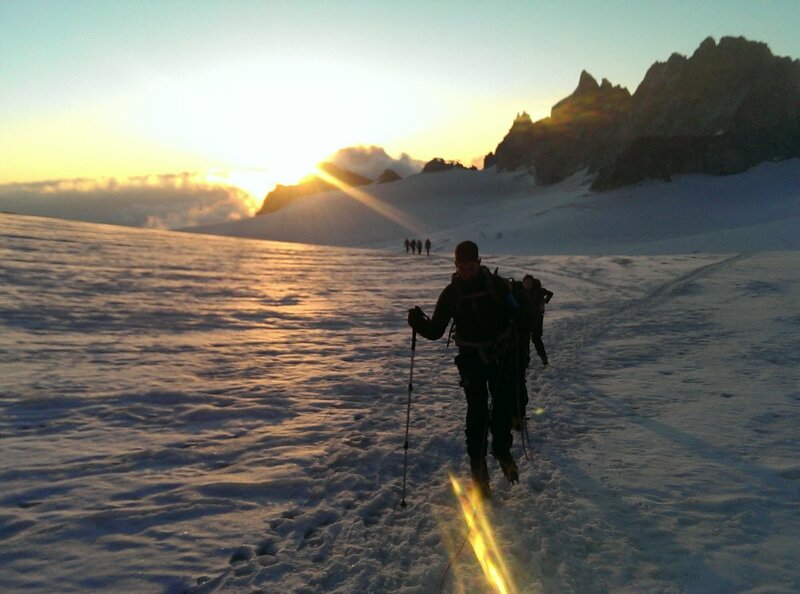 The day starts off with an glacier approach from the Torino Hut to reach the Col d’Entreves where the fun starts. The climb brings us along the thin rocky ridge and will be good practice for the following climbs. Night at the Torino Hut. This will be your first taste of high altitude and a perfect warm-up for our climbs to come. The climbing starts by traversing across the Vierge plateau and then ascends towards the salle a manger of the Dent du Geant 4013m. The climb is a great practice route for our future climbs and is on fantastic granite. The summit offers a tremendous view of many bigger peaks in the range. Today, we are on our way to start climbing the big three summits. First however, we must start off the day by climbing up to the Gouter hut 3818m, which involves a long 5 hour ascent over an easy rock rib to the summit of the Aiguille du Gouter where the hut is located. Night at the Gouter Hut. Summit day at last. After a classic alpine start at 2 am, we are off by headlamp light up the Dome du Gouter 4305m and up to the Vallot emergency shelter 4363m for a quick break and something to eat and drink. From here, we ascend the thin ridge of Les Bosses, pass the Tournette rocks and finish on the final never ending ridge up to the summit of Mont Blanc 4808m, highest peak of the Alps. Outstanding views of all of the major ranges of the Alps can be seen from here. The 360° panorama is breathtaking! One down, two to go. Today you get a casual start before we make the journey by car to Zermatt. If time and energy levels permit, we can even squeeze in a via ferrata above the town of Zermatt before dinner. This morning will be used for travel by car to the alpine resort of Zermatt. A quick walk through town and we are off to a series of cable cars to Schwarzee. From here, we hike the remainder of the way to the Hornli hut 3261m – 10,695 ft, basecamp for our ascent of the Matterhorn. Night at the Hornli Hut. Another before dawn start, this time 4am, a quick breakfast and a hurried scramble off to begin our ascent. It is important to be off quickly, as there are often many other groups and being stuck behind them will cut into precious time. However, many non-guided parties will often get off track and fall behind. No worries here, as this is my favorite climb, and we will certainly catch many on the way up, saving us not only time but more importantly energy. Our climb will take us up through some very steep, exposed sections of rock at the start, that then kick back a little the higher we go. 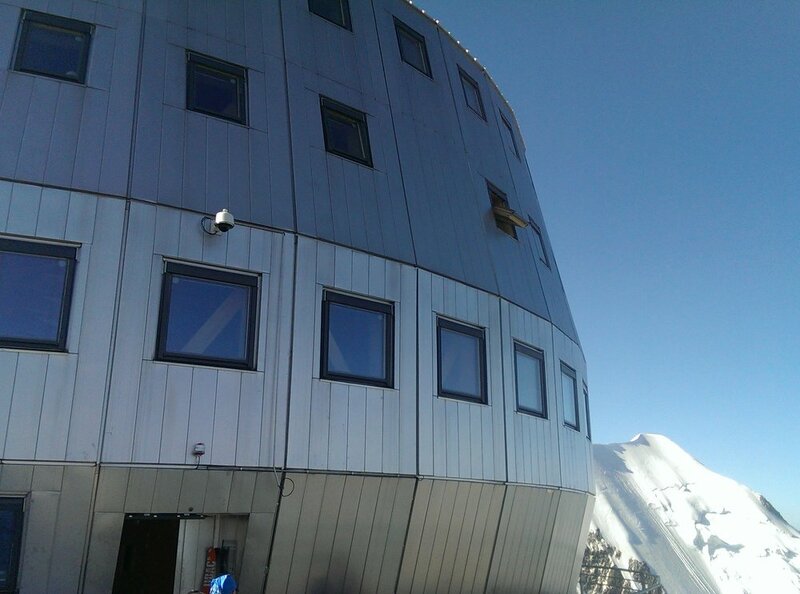 After a few harder pitches, we will arrive at the Solvay emergency shelter 4001m – 13,133 ft and take a well earned break. Once past this point, we follow the very edge of the ridge up to the fixed ropes leading to the snow capped summit field. Here at the very isolated summit of the Matterhorn 4479m – 14,691 ft , one has a strange feeling of just how sharp and pointed the Matterhorn really is. Again we will have some very impressive views of the surrounding mountains of the Valais region – the region of the Alps with the highest concentration of 4000m (13,120ft) peaks of which there are 32. From the train station in Grindelwald, we will take the famous cog wheel train up through the pastures and alpine meadows lying below the North Face of the Eiger to the Kleine Scheidegg hotel/restaurant, and then on through the inside of the Eiger up to the Eismeer station 3160m – 10,364 ft. A short, light lunch and then we are off to the Mittelligi hut 3356m – 11,007 ft, spectacular surroundings and awesome views! Night at the Mittelligi Hut. A grand finally to a fine week of grand climbing. *Please note that I do not add an extra "fluff" days before or after. I consider that to be false advertising. My program is 12 actual days of activity. Excellent base fitness – and prior experience is highly recommended. Please do not under-estimate the nature of the course. This is the hardest, most intense alpine course I offer. However if you have great stamina and some decent experience - it is absolutely possible. Some moderate to steep snow, mixed terrain and exposed climbing on rock. Maximum group size is 1 : 1 - the entire course is run on a private basis. For the ascent of the Eiger and the Matterhorn the max ratio is 1:1. 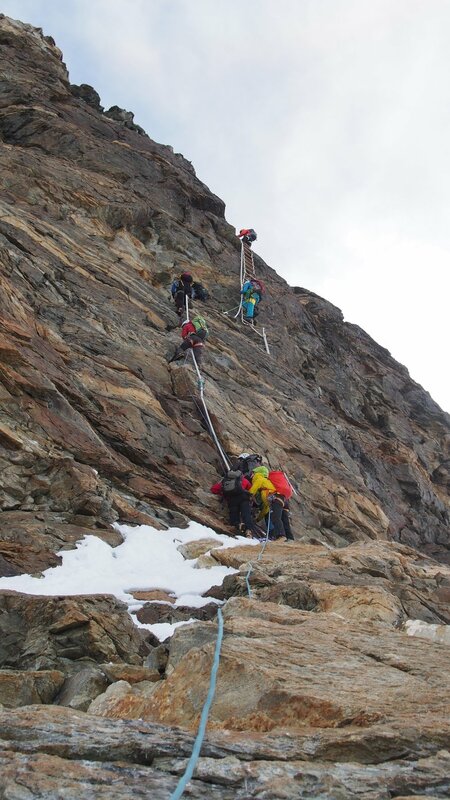 If more than 1 participant (friends, significant other) signs up at the same time, each group will climb with their own guide the entire week. *This is a super important detail that pays dividends when on both the Eiger and the Matterhorn - you want to know your guide just as much as your guide wants to know you! Meeting your guide the day before an ascent is far from ideal. I don't believe in courses where the climber to guide ratio is different than that of the actual ascent. This is how "guide companies" become greedy....at your personal expense.